Just so you can put faces to names, this is us! Maggie accompanies Chris on most L7C trips and sprint meetings, but draws the line at going to all the L7C club meetings (as talking about engines and the like with a load of petrolheads is not her cup of tea - or in her case, glass of wine! ), she also leaves early morning blats to Chris too! 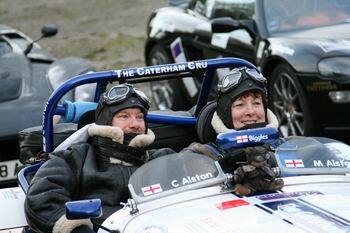 Chris regularly attends the North Kent meet, the Kent & East Sussex meet and the Weald meet. Between us we have travelled many thousands of miles touring France, Germany, Belgium, Luxembourg, Switzerland, Austria, Italy and Andorra as well as plenty of trips in the UK. We have made so many friends over the years and it is fair to say a lot of our social life now revolves around the Seven and our 'sevening' friends. We do, however, have other interests and we particularly enjoy following most sports, not least football and motor racing. Chris originally trained as an Accountant but after 25 years of number-crunching decided he needed a mid-life crisis and retrained as a Driving Instructor, qualifying in October 2004. Maggie worked in investment banking in the City for many of the 30 years she commuted to London and was then Office Manager at Biggin Hill Airport in Kent for almost 10 years. Having lived in Orpington, Kent for 16 years, we recently moved to Heathfield in East Sussex and Maggie has been temping in various locations whilst looking for an interesting permanent role.